Whether we’re in the back shed tinkering with our bike or blasting down the road there is a freedom and stress release to motorcycling that cannot be denied. But when your job is literally keeping people alive while they undergo heart surgery the need to relax after work becomes that much more important and so it is that Nicolas Vincent Perna a Cardiovascular Perfusionist from Canada spends his winters building a different bike each year. Nick has a love for low mileage classic Honda’s but having been born in Italy just south of Rome he has a soft spot for the Bologna beasts too. 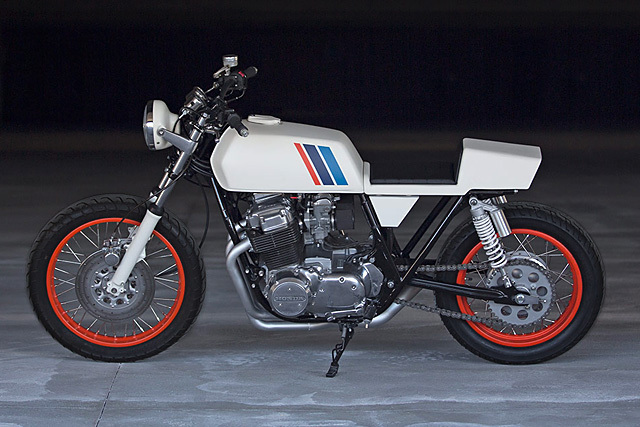 So when he tracked down this 1982 Honda CB750 with just 4000 miles on the clock he saw an opportunity to create one very special Honda with some Ducati sauce and a side of Britain’s best for one hell of a ride. We all find our way to motorcycles in different ways, for the vast bulk who throw their leg over the two wheeled contraptions it is purely about cheap transport and nothing more. But for the early customisers who had returned from the Second World War to today’s feature bike builder there was a therapeutic aspect to both the riding and the building of their creations. When Tyson lost his parents he needed to find his own form of therapy and picked up a nice Buell to take to the streets. 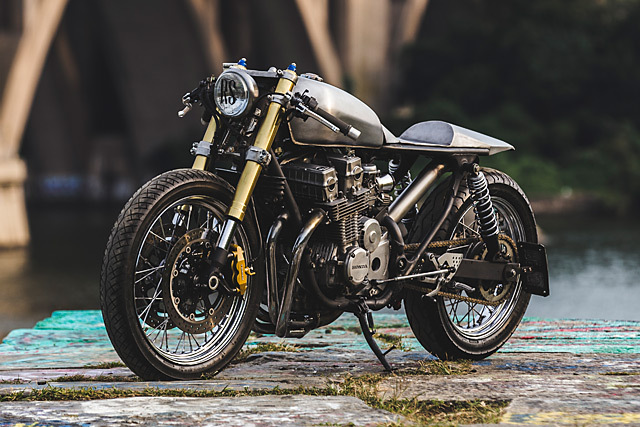 But riding alone just wasn’t doing it, with ideas swirling in his head and wanting to experience the meditative state of spinning spanners he picked up a sweet running 1973 CB750 and his true motorcycle journey began. In the last few years news articles beginning with the words ‘Florida man’ have become a running joke. There’s even internet forums devoted to headlines that depict some of the most wonderfully bizarre acts to come out of the Sunshine State. If you get a moment, they’re worth checking out; ‘Florida Man Breaks into House, Poops on Floor and Drinks Contents of Vacuum Cleaner’ is my personal favourite. For me, that best sums up some of the drunken, insane characters that make up the unwashed social fabric of much of the South. 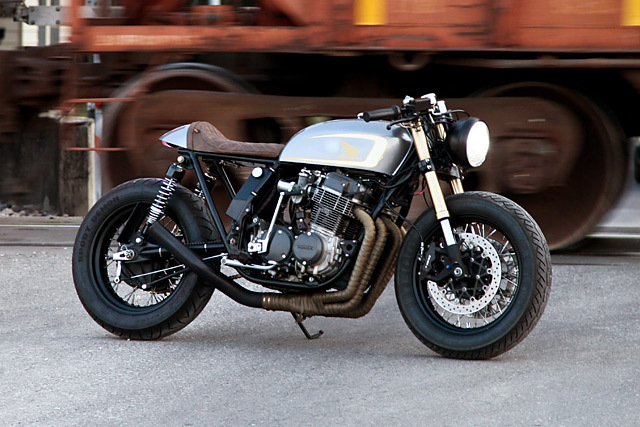 Against such inebriated anarchy and swirling head noise stands Florida’s Steel Bent Customs, one of the most professional and consistently clean builders around, who have turned their capable hands to this 1978 Honda CB750 Super Sport. 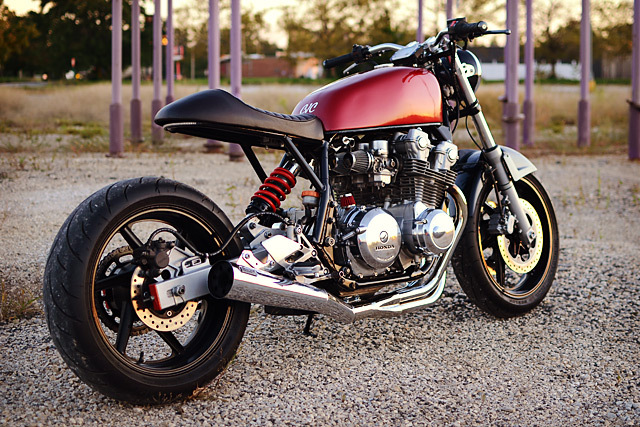 Gaige Redd wanted to build himself a café racer with ‘80s race car styling all using a Japanese bike from the Seventies – an idea that could go horribly wrong if it wasn’t designed and executed perfectly. But Gaige had a big advantage, he’s a designer by trade and he knew sticking resolutely to the brief would yield exactly the bike he desired. 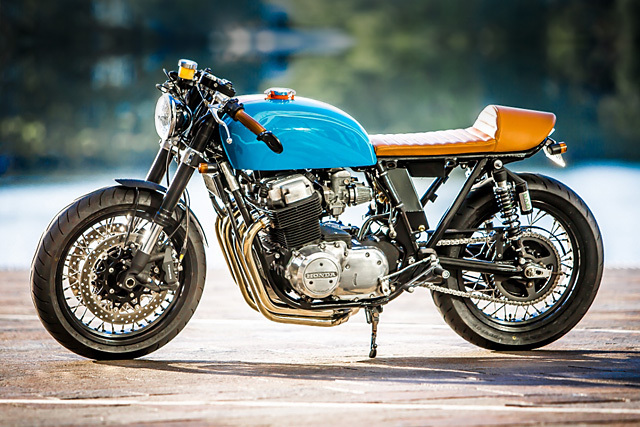 The finished product is a cracking Honda CB750 that tips its hat to the classic BMW race cars that flew the flag for M Sport. There any many things in this world that you could class as overdue. Peace in the Middle East, for one. A decent Nicole Kidman film would also be nice. And Nickleback announcing that they are breaking up has been overdue for about twenty years now. But when it comes to us and bikes, there’s been a task on our list that’s been hanging around for ages – and that was to post a bike from one of our first ever sponsors. 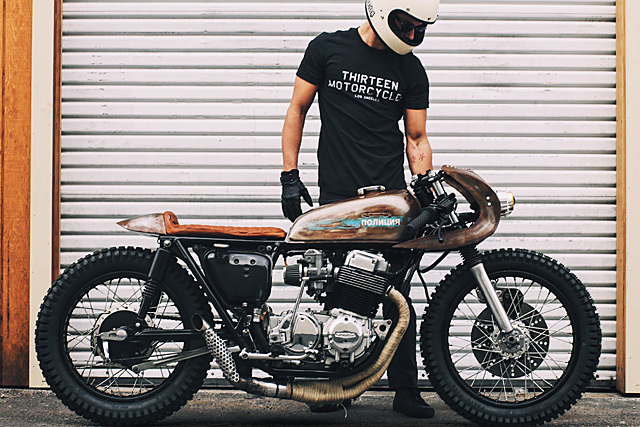 That company is Brisbane’s Rocker Classic Motorcycles, and this is us crossing that bad boy of our list. Tanks and seats. If you had to distill down the art of the custom motorcycle, moonshine-like, to its base elements in a concentrated form I’d argue the toss that tanks and seats is where you’d get to. Sure you’ve got wheels, tyres, bars and a whole cavalcade of other minutia you can tweak to make things look like this or that, but get the seat and tank wrong and it’s goodnight nurse. So when Barcelona-based De Palma Cycles told us they had a build inspired by the Honda RC110, arguable the world’s best ever tank-and-seat combo, we were more than a little excited. And then we saw the bike. 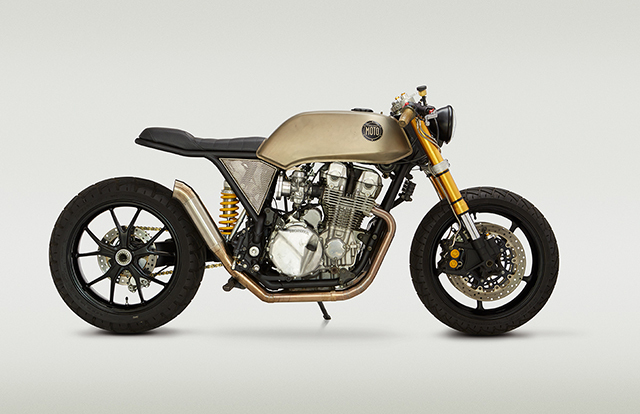 Custom motorcycles often leave an audience profoundly polarised, while some lavish praise others ridicule and scoff. It seems the further from sedate you go the more divided the opinion, but designers like Terblanche and Tamburini have shown that is not always true and great custom builders can do the same. 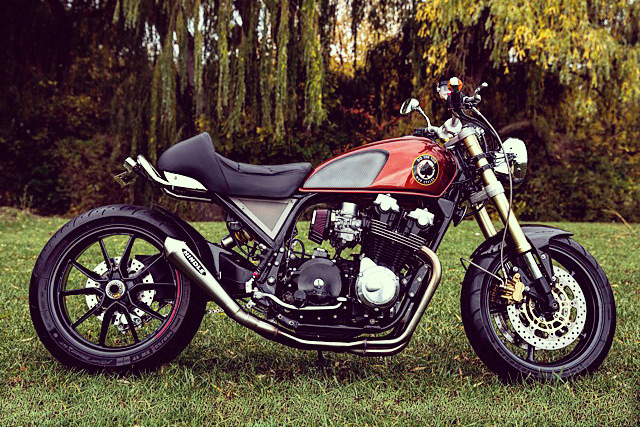 Create amazing one off motorcycles that receive almost universal acclaim, are anything but bland and always show off that signature style that lets you know the brains behind the build. 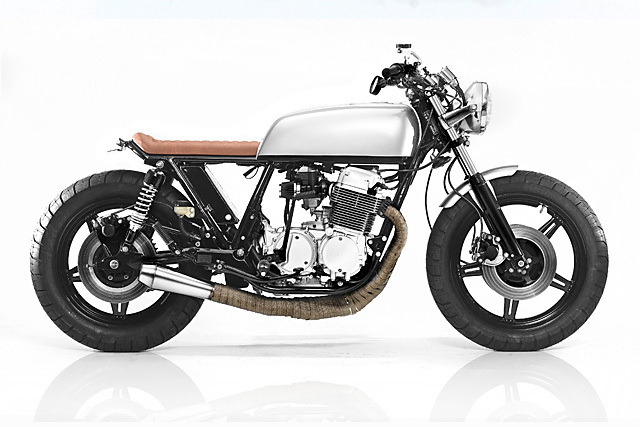 Enter John Ryland, Classified Moto and a Honda CB750 known as Mr Hyde. 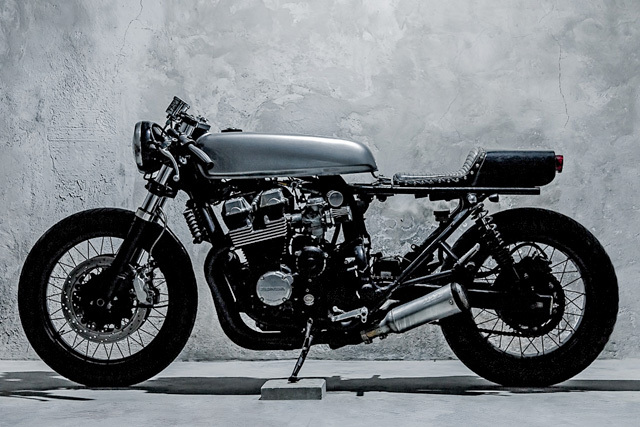 I always eagerly anticipate a new build from the Richmond, Virginia based workshop and this 1992 Honda CB750 Nighthawk certainly doesn’t disappoint. Customer Jordan had seen a pre-Nighthawk CB750 build of Classifieds called the SuperStrada and wanted something in the same vein. The first thing that hits you in the eyes is the single sided swingarm and this is certainly no bolt on conversion. While the Ducati Multistrada swingarm remains stock the Honda frame required considerable fabrication and welding expertise from Seth and Danik to get the two working in harmony. The Showa shock originally fitted to the Ducati remains in place while just like SuperStrada the rear wheel is from a Ducati 1098.